The Ferrari 360/430 platforms came standard from factory with coilover suspension which allows for ride height adjustment in true racing fashion! Those who opt to lower their car (most enthusiasts seem to for better looks and lower center of gravity) can do so with a bit of know how and also the right tools. Note that you will most likely need to take the car to a workshop to have a professional alignment done once lowered. We provide a rough guide below on how to adjust the factory coilover for those who like a bit of DIY. For a standard 360 the height is 125.2mm at the front and 146.8mm at the rear. Front: Ahead of the front wheel there is a rubber drain tube. Measurement is just behind that tube on the aluminum frame. Rear: Below the curve of the lower air scoop. Ferrari also suggests doing the measurements and alignment with a 70kg load in both the driver and passenger seat/footwell area to replicate the weight of an average person. 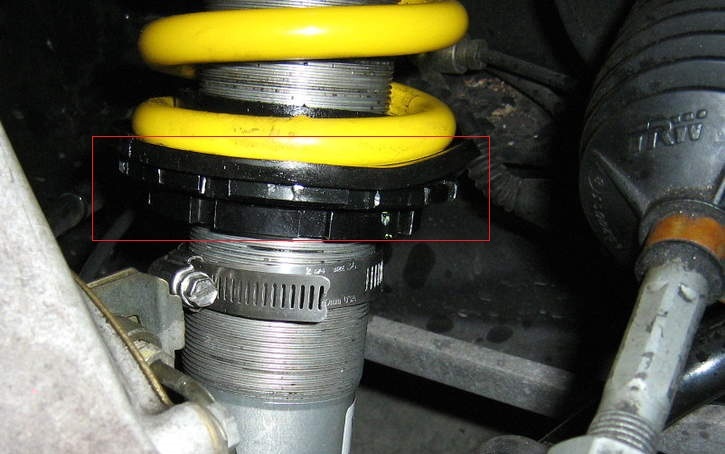 In order to adjust the height, you will need to loosen the perches using a C-Spanner (can be purchased here) holding the spring in place, these are highlighted in red below. The upper perch is 90mm and the lower perch is 70mm - purchase the according tools on the website. Calculating vehicle drop is based upon the number of downward turns of the spring perch. Total body drop is affected by the Motion Ratio which is the ratio of shock travel versus wheel travel. It is equal to the Shock Travel (in inches) per 1 inch of Wheel Travel. Motion Ratio is used to account for the different suspension geometries and the resultant mechanical leverage on the spring. In almost all cases, the Motion Ratio is less than 1. One can generally calculate the Motion Ratio by simply dividing the shock travel by the wheel travel. Example if the shock travels 0.5 inches and the wheel travels 1 inches then the motion ratio would be 0.5/1 = 0.5. To achieve a 1" drop, we can base the calculations on the MR value as 0.70, 12 turns will drop your vehicle 1" (25.45 mm/cm/1.5mm = 16.97 turns X 0.70 = 11.88 turns/cm). The threads on the Ferrari shock body are pitched at approximately 1.5 mm which means that every turn of the ring should equate to a drop of 1.5 mm. This means that for every downward turn of the top spring perch nut with a motion ratio of 0.70, you would get about .084” of downward travel of the body. Once you have completed lowering the car, tighten back up the spring perches and head on over to your alignment workshop which we mentioned earlier. 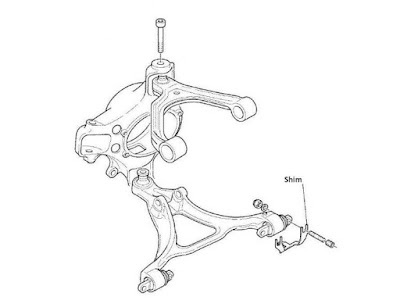 Camber is adjusted by inserting or removing shims between the bottom wishbone mountings and the chassis. Increasing the width of the shim pushes the lower wishbone outwards and thus the top of the wheel leans into the car more = more camber. 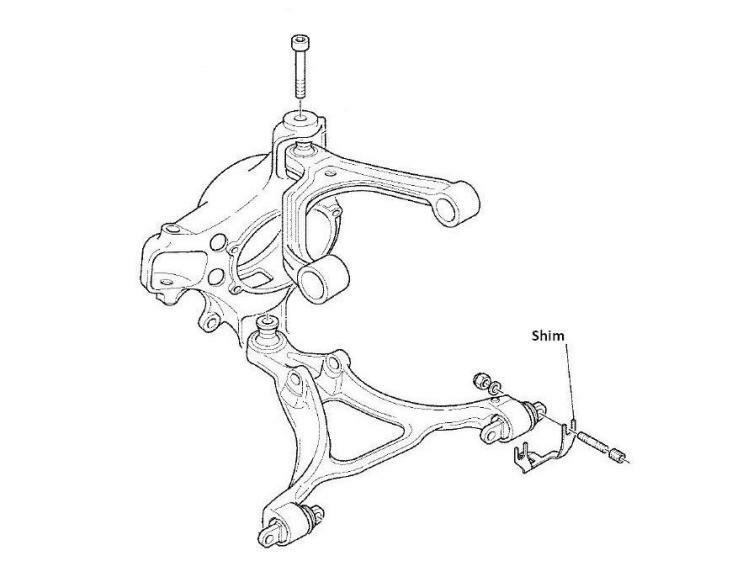 Adjustment requires removal of the wheel, undoing the wishbone, inserting or removing shims, refit wishbone and wheel then lower the car and re-measure the camber.